Ingredients: almonds 17 %; glucose syrup; cocoa butter; whole milk powder; hazelnuts 6 %; clarified butter; honey; emulsifier: soy lecithin; sweet whey powder; melon; orange zest; glucose-fructose syrup; cherry concentrate; acidity regulator: citric acid. May contain traces of gluten, nuts, egg, lupins, sesame and peanuts. The statutory mandatory information such as content, best-before date and manufacturer/distributor are added automatically during production. 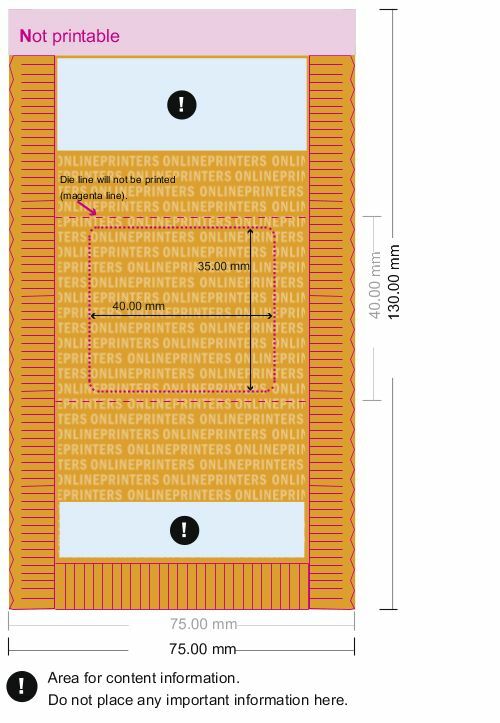 The corresponding box must not be removed or repositioned in the print template. Shelf life: 4 months from date of delivery when stored properly. Store in a dry and dark place, between 14 °C and max. 20 °C, away from direct sunlight. Do not store near heat sources (e.g., heating). Observe the statutory regulations for printable food contact packaging. Please observe the information about the ingredients and nutritional information per 100 g.
Preferably use sans-serif Fonts, e.g. Arial, Verdana, Helvetica etc. The production times listed apply – unless otherwise indicated upon receipt of your complete order (including printing data and payment) on working days before 3 pm (GMT).